Jacques Mury (2nd left), General Manager of Centara Grand Beach Resort & Villas Hua Hin recently organized a press conference for the ‘Hua Hin Automobile Concours 2012’ at Hua Lampong Railway Station. This event is held every year, with 2012 being the 10th year, which will be organized from December 14 – 16, 2012. The event this year is dedicated to Thailand’s three auspicious occasions, the 85th birthday of His Majesty King Bhumibol, the 80th birthday of Her Majesty Queen Sirikit and the 60th birthday of His Royal Highness Crown Prince Maha Vajiralongkorn, all of which fall in 2012. The aim of this year’s event is also to assist in creating destination awareness, throughout Thailand and abroad, as well as displaying the charming classic and vintage cars. 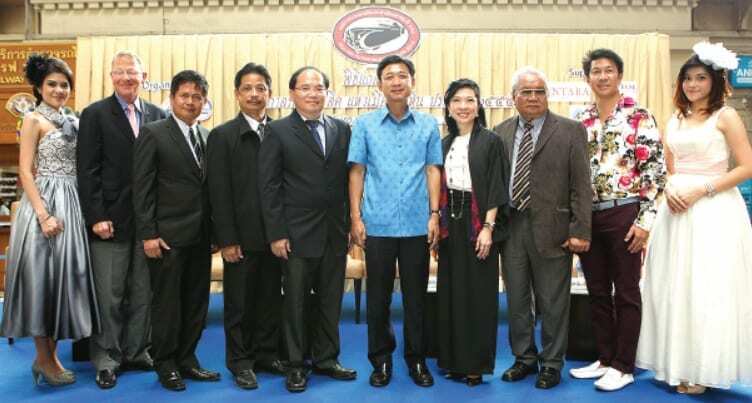 From photo: (from left) Prim Srisukawat, Sales Executive – Centara Grand Beach Resort & Villas Hua Hin, Mr. Mury, Montri Choopoo, Deputy Mayor – Hua Hin Municipality, Nutpakhal Akkarawich, Assistant Director – Tourism Authority of Thailand Prachuab Khirikhan, Viroj Treamphongpun, Deputy Governor [Governor] – State Railway of Thailand, Sommit Silpprasert, Provincial Deputy Governor of Prachuab Khirikhan, Supatra Chirathivat, Senior Vice President – Corporate Affairs & Social Responsibilities – Centara Hotels & Resorts, Prachin Eamlumnow, President & CEO – Grand Prix International Co., Ltd., Sayam Sethaputra, President – Mercedes-Benz Club (Thailand) and Sukonthip Boonprong, Sales Coordinator – Centara Grand Beach Resort & Villas Hua Hin.